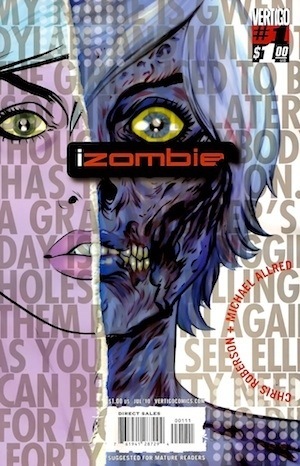 When talking about comics in general, there’s one title that I always recommend to people: Vertigo’s iZOMBIE. This Eisner-nominated title by Chris Roberson and Mike Allred is a fun monster book with interesting stories and incredible art. I saved this one for last because it’s the best monster title of the past few years. The zombie in iZOMBIE is Gwen. Unlike the shambling, mindless cannibals of titles like The Walking Dead, Gwen is very aware of her situation, and except for the fact she’s undead and needs to eat brains every once in a while, is a typical young woman. She even has an active social afterlife, with her roommate Ellie, a mod ghost, and pal Scott (Spot), a were-terrier. (Yes, I said were-terrier. It’s as silly and awesome as it sounds.) They hang out at Dixie’s diner, and all seems normal. Lest you think this title is always lighthearted, let me clarify. Roberson and Allred create a fun environment, but there are monsters everywhere. Vampires, a mad scientist (who looks a lot like the Bride of Frankenstein), and the mysterious and ancient Amon all lurk about to bring trouble to Gwen’s quiet Oregon town. There are mysteries aplenty, and among adventures with the government’s monster squad, the Dead Presidents, and sinister plots, Gwen and friends navigate relationships and breakups. The book only lasted for 28 issues, but they are amazing. The last arc is one of the best things I’ve read in comics ever. From the moment I saw Gwen in the House of Mystery Halloween Special dressed as Shaun of Shaun of the Dead, I knew I was going to love this book. It’s easily collected in graphic novel format, and it’s a quick read. I cannot recommend this title enough. Check it out! 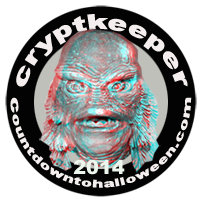 Tags: Allred, art, blogoween, comics, halloween, love, Roberson, zombies. Bookmark the permalink.